SANTA CLAUS MADE HIS LONG-AWAITED APPEARANCE over the top of the Town Hall roof on Thursday night, but disappeared again soon after. The explanation was that as he's made up of four parts, and takes four hours to inflate, they decided, so waiting crowds wouldn't be disappointed, to inflate just the head. But Councillor Pat Karney offered another explanation - Santa had gone off to an all-night party. 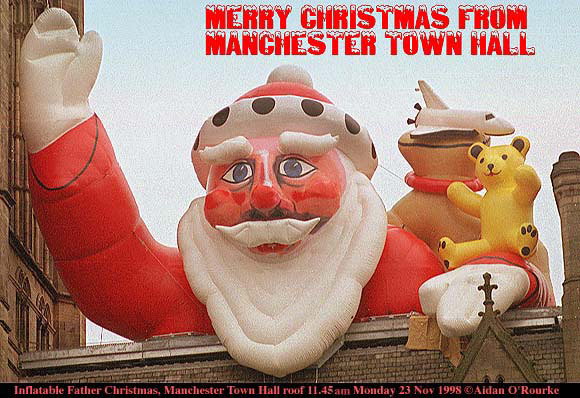 He returned the next day fully inflated and is now fully installed on the Town Hall roof as you see above. What do you think? Better than the previous Santa? THE ANNUAL CHILDREN IN NEED EVENT TOOK PLACE ON FRIDAY NIGHT, with fund-raising events all around the area. Net Nannies, the IT Support specialist, (MD Candace James), donated money raised from support services on Friday to the Children in Need Appeal. Adults played hopscotch in Albert Square to raise money, and Vidal Sassoon hair stylists did their stuff and made �5, which they donated to the appeal. The final figure was over �m nationally. The north west raised �1,730. And another fund-raising effort took place earlier in the week at Manchester Airport: a group of 200 sponsored volunteers hauled a 61-tonne Boeing 757 a distance of 50 metres. The money will help to send deprived north west families on a holiday to Florida. MANCUNIANS CAN FLY TO AMSTERDAM, NICE - and from Jan 99 - Geneva and Barcelona for just � single, including tax, on EasyJet via Liverpool. And Greek boss of EasyJet Stelios Haji-Ioannuo is to open a cybercafe in Manchester next year. APOLOGIES - DUE TO A TECHNICAL PROBLEM, AS YET UNSOLVED, the lower section of some of the photographs is being lost during transfer from my home computer to the server. I am trying to solve the problem, in the meantime, please excuse the grey band at the bottom of some photos! THE ROYAL EXCHANGE IS ABOUT TO RE-OPEN and on Wednesday we attended a special free-of-charge "sound check" preview. It was the first time an audience had been inside the theatre since the bomb. The theatre is now the best equipped in the UK, particularly as regards sound. A variety of noises were used to test the acoustics, starting with single pulses played on a strange-looking speaker. Sound technicians monitored the echo. There was live and recorded music, an excerpt from the play "Hindle Wakes" and a rockband. They were loud - very loud, but couldn't be heard in the restaurant - so good is the soundproofing. It was very impressive, though most of the audience - very few under 30 years of age - weren't too impressed with the rockband. I thought they were very good. 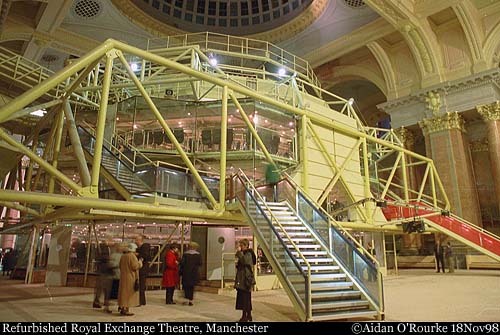 And the good news is that the Royal Exchange opens to the general public on November 30th. The bad news: Theatre-goers will have to pay! Seats start from � And on Saturday 12 December there will be a Royal Gala performance to mark the re-opening, with HRH Prince Edward, and celebrities including Patricia Routledge and Tom Courtney. Tickets are �0 a head. THE HALLE ORCHESTRA IS HAVING TO FACE THE MUSIC, yet again - It has a deficit of �0,000, and tonight, members of the Halle Orchestra Society are meeting in order to work out a survival plan. Costs will have to be cut, and there may be redundancies. MAYBE MANCHESTER IS STARTING TO GET LIKE NEW YORK, with film crews on every street corner - yesterday in Chinatown, I saw police, cameramen, trucks and lights - I don't know what they were filming - can anyone help? And watching the film "Damage" starring Jeremy Irons and the captivating Juliette Binoche, I noticed a familiar-looking "House of Commons" interior: It was the Statue Hall in Manchester Town Hall. Another local face on the TV at the moment is Manchester Polytechnic-trained Susan Cleaver, who features in the eccentric Batchelors "Pasta 'n' Sauce" advert. I remember seeing her in "Lysistrata", starring Dave Threlfall, at the Royal Exchange about ten years ago. A NATION WENT INTO MOURNING at the death of Des in Coronation Street, or so some newspaper headline writers would have us believe. There was a huge power surge after the programme as millions of kettles were put on. Viewing figures have been topping 18 million (18.17 million Monday 19 Oct - BARB figures quoted in the current Radio Times). But K Fitton of Hyde, in the MEN postbag, thinks it's degenerated to the level of pantomime, sitcom and Cell Block H drama. I tend to agree. 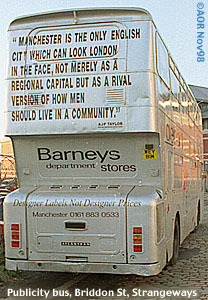 But whatever you think of the content, Manchester's "Street" is winning the battle of the soaps. Personally I prefer real-life drama, particularly a US-produced programme about the "Dumbest Drivers". In amongst the pictures of road rage in West Virginia and lunatic driving in Florida, there was an example of criminal highway negligence in Manchester - a Greater Manchester Police X-Car pursed a "sedan" which was raising a shower of sparks on the M66 (now M60) - a part of the body was touching the road. The programme didn't identify the northern English location, or the occupants, though the policemens' accent was instantly recognisable! MANCHESTER'S NEIGHBOURING CITIES OF LEEDS AND LIVERPOOL have featured in national crime headlines this weekend, one of them with a direct Manchester link. 23 year old Orville Sean McIntosh was shot dead in the Chapeltown area of Leeds. Police think killer and victim were acquainted. And in Liverpool, a man has been arrested and charged with kidnapping 58 year old Charles Seiga. He was held for 30 hours and is reported to have been tortured. THE CONTRACT KILLER WHO MURDERED 5 YEAR OLD DILLON HULL was given a life sentence last week. Paul Seddon, whose face appeared on the Wednesday's MEN front page along with his two accomplices, was put away for 25 years. But the gang boss who commissioned the job may well be living in luxury. Seddon might be granted a reduced sentence if he reveals the identity of the person who ordered the killing. A plaque has been put up on Jauncey Street, Oldham in memory of Dillon Hull, born 27.11.1991 and shot dead 6.8.97. TWO CHILDREN WERE KILLED in a house fire on Telryn Walk, off Crescent Road, Lower Crumpsall on Thursday night. Firefighters were devastated at being unable to save Carina Yardley (2) and her three year old brother Lewis. 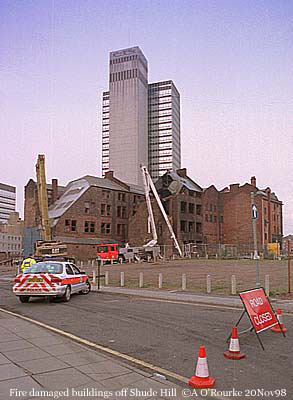 There was also a fire in the disused buildings in the picture (right) near Shude Hill, in front of the CIS tower. It's thought the fire may have been started by people sleeping in the buildings, and lighting fires to keep warm. CATHY HALL, INJURED LAST WEEK ON THE M602 BY MISSILE-THROWING YOUTHS, says she isn't angry with the young people who nearly killed her, just glad to be alive. She's recovering at her home in Crosby, near Liverpool. BARÇA IS ONE OF MANCHESTER'S MOST FASHIONABLE BARS, located in Castlefield and part-owned by Mick Hucknall. But FC Barcelona - the football club - have put in a legal objection to the attempt by Barça (Manchester) to register the name as a trade mark - FC Barcelona say it could be confused with them - "Barça" is roughly equivalent to "United" here. But we don't get confused with the airline or brewery conglomerate or dairy of a similar name, do we? RECENT CONCERTS HAVE INCLUDED Pulp at the Apollo, the BBC Phil at the Bridgewater Hall, Oliver is making audiences beg for more at the Opera House, and at the MEN Arena the Lighthouse Family and evergreen female crowd-puller Tom Jones brilliantly reviewed in Saturday's MEN by Paul Taylor. THE WEATHER THIS WEEK has been cold and generally overcast, though there were spells of hazy sunshine on Friday, when I took the photo below. Outside it's 6 degrees Celsius, 42 degrees fahrenheit. PLEASE HAVE A LOOK AT THE NEWLY REVAMPED IMAGE COLLECTION, including the new-style index pages, now using thumbnail images. I'm still experimenting with formats and layouts. Please let me know what you think. The new developments are thanks to my fabulous new Apple Macintosh G3, and new web authoring software, including Macromedia Dreamweaver, Macromedia Fireworks, and of course the program I rely on most of all, Adobe Photoshop. I'm sitting here writing to you on my vintage 6100 worrying about the odd noise it likes to make now and then. I'm ready for a G3 too but tell me why didn't you go for an iMac? I just finished watching "Reckless" the movie with Robson Green and Michael Kitchen and made by Granada. I was enjoying the glimpses of the city that even after so many years is so familiar and so much part of me. Then I came up here and read the story of the brick throwers on the bridge. I suppose that's the essence of Manchester - a wonderful idea - a magnificent spirit and at the same time ugly, scruffy and at times ruthless. Thanks once again for some great copy and brilliant pictures. Oh, and thank you for settling a family argument. I recently found an old school friend who now lives in Blackley which my wife of Saskatchewan origin wants to call Black-lee, thank you for confirming that it is indeed Blake-lee. Although I think the iMac is a wonderfully designed computer, I bought a G3, as it has more expandibility and is slightly faster - I want to add a 21" monitor and powerful graphics card. Unfortunately you can't do this with an iMac. Well, if Natalie Portman isn't taking part, I don't think I'll audition! Thank you very much for the pictures you took of Daisy Nook! I grew up in Littlemoss just about a mile from the country park and worked at Daisy Nook Garden Centre for a few years prior to moving to Whitehouse, Ohio USA, eleven years ago. I was so pleased to see pictures you took and look forward to seeing any others of the surrounding area you may have. My wife and I look forward to your weekly reports as it keeps us updated with information that we wouldn't normally get. Thanks very much, and keep reading! Hi Aidan Once again thanks for all the great photos. My wife and I are Originally from Cheetham Hill and Higher Blackley, now Living in Sydney Australia for 32 years, We wouldn't mind a few Photos of these areas when you're passing if possible, if not it will not stop us enjoying your work as always. Thanks very much for the message. I'll try and get up that way soon, but I like to take photos during sunny weather, so I often have to wait! By the way, readers, Tony sent me a superb class photo of taken at St Marks School, Heath Street, Cheetham Hill, 1947. I'm sure he'd like to hear from other people from that school/year. Hi Aidan (and anamaria?) First off let me say thanks a million for keeping all of us far flung Mancunians up to date and in the picture, I`ve followed "Eyewitness" almost since the first issue came out and the quality of both the words and pictures are way above anything else connected with the big M currently on the net. Just one thing is missing, born in Ancoats, I was pleased to see you have covered parts of the area with your trusty camera, but what about next door! Miles Platting! home of the brave (my mother and the rest of the family have lived there for over 20 years, which in my book makes them very brave). Not one picture in all of the "image collection", Tell me this is a mistake soon to be corrected and I will sing your praises from the mountain tops of Sweden. Have a look at pictures 628 and 632! Did you report anything on the trade mission to Kuala Lumpur and the Manchester band King Rib who were a huge success out there? I have above - thanks for reminding me of it. If anyone has any other stories they'd like me to investigate, please contact at any time! Christmas seems to come earlier and earlier each year. Did you hear about the local householders who put up their Christmas lights in September and keep them up till just before Easter! Does anyone out there know who these people are? I'd like to take a photo! Hi Aidan. It's Mary Hodgkinson again. I E-mailed you several weeks ago to compliment you on the fantastic photos you take, in and around Manchester. My parent's live off Sledmere Close, which is just off Grey Mare Lane. I know that area has changed considerably! The landscape is now quite flat and uninteresting. Still I believe the Market is still thriving! Anyway Aidan, any photos of that area would mean a great deal to me. Thanks in advance. Yes, I agree, that area isn't half the place it used to be, but there's still plenty to see there. I remember visiting Grey Mare Lane market as a child. Picture coming soon. Hello there! Greetings from Norway to you. My wife and I visited Manchester in July this summer. Great city, nice city and most of all a friendly city. We stayed at Hotel Britannia on Portland Street, because our daughter was working there. She is still living and working in Manchester, and likes it very much there. She lives in West Didsbury on Old Landsdowne Rd. West Didsbury was also a nice place to visit. We are looking forward to visiting the city of Manchester again. Regards Henning Hansen, Elgveien 32, 4300 Sandnes, Norway. Glad you liked Manchester, and hope you'll come again soon. You'll soon be able to find overview maps of Manchester on this website. But for detailed street maps, you still can't beat printed ones. I use the Geographer's A-Z Greater Manchester street atlas, ring-bound, priced at �.50. I'm also very keen on the Ordnance Survey maps. Please contact me if you'd like further details. The person of the week should be Sean a young boy age 13 who lost his father Nov 23,1997 and then his mum this morning at 5:30 am Nov. 22 1998. I became friends with Sean a month ago. He is with a heavy heart. I am Eleanore age 58 from Ohio in the United States. Sean lives in Manchester, and Eleanore, in Mogadore, Ohio. She tells me she has corresponded with Sean via e-mail, but doesn't have any other details about him, other than that he lives in Manchester and his sister is at university here. She'd like to know his postal address so she can send help and condolences. Has anyone heard anything about Sean or know him? Thanks & lots of festive cheer, Hannah. Of course, I will include a picture taken in Whitefield - around Church Lane is nice. I need to wait for some good weather - don't despair, we should have some by Christmas! Whilst looking for information on where I can get prints of paintings of Manchester city centre scenes from earlier this century, I came across your pages on the Manchester On-line website. Do you have any recommendations as to where I should look? 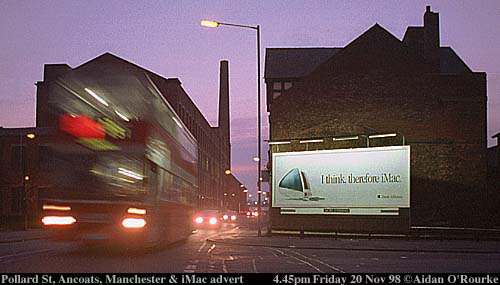 An ad appeared in the MEN of Tuesday November 3rd with nostalgic paintings of Manchester by Bernard McMullen. Phone 0161 203 5858 for more details.